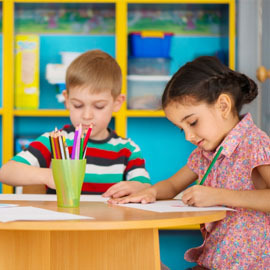 At First Class Child Development, we place a hefty emphasis on promoting cognitive development in every child who is enrolled in any of our classrooms. 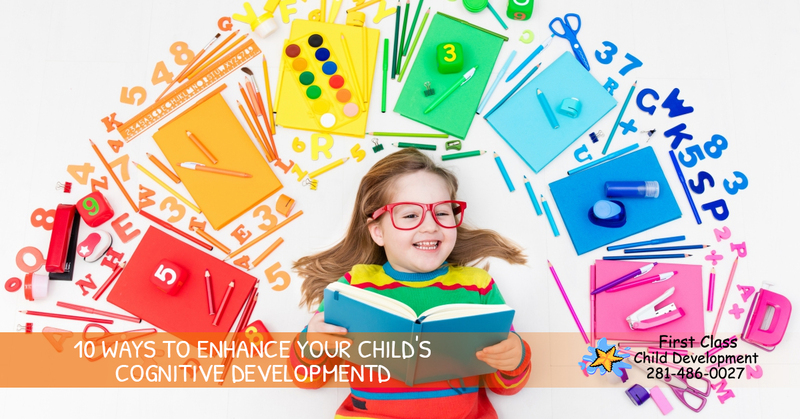 If you are not familiar with what cognitive development is, it is simply the way a child learns and acquires knowledge while interacting with their environment. As children age, they begin to gain different cognitive skills. However, participating in different activities can speed up the acquisition of these skills. While we do everything we can to help your child while they are in our care, there are plenty of things you can do when you are at home or running errands with your child to help their cognitive development as well. Continue reading below to learn more about the best ways to do this. You may not realize it, but each time you are in the house or the car singing with your child, you are promoting both their memory and their word identification skills. We know, hearing the same song over and over again (especially a children’s song), can be a bit wearing on your sanity as an adult. 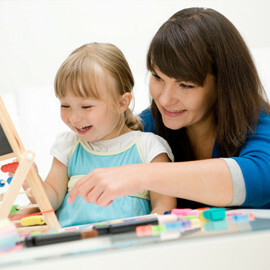 However, remembering that your child is benefiting from the practice may help you get through it. You may not realize that your child doesn’t know what certain sounds are. That is why it’s important to point out certain noises to your kiddo, like bird chirping or water running. Understanding how sounds are connected to objects is an important part of cognitive development. Singing the alphabet or reading alphabet books with your child can help to make them much more familiar with not only how letters look, but how they sound. You may also want to purchase some alphabet puzzles in order to switch up your normal alphabet games as well. Regardless of what you and your child are doing, chances are you can find opportunities to count with your kid no matter where you are. Whether it’s counting how many toys are on the ground that need to be picked up, or the number of swings at the playground, reinforcing the order of numbers will benefit your child in the long run. Another way to help your child’s cognitive development is to make sure you are pointing out shapes and colors when possible. You can do this by pointing out “the red octagon” at a stop sign, and so on and so forth. Allowing your child to make decisions about what they wear or what they eat will help to make them feel more independent and confident, both traits we want to help our children to develop. It may seem as though your child never stops asking you questions. However, it’s important that you ask them just as many. Asking your kid questions about basic things like “Why should you share your toys?” and “When do we wash our hands?” will help them to develop problem solving skills, as well as better connect to their environment. Visiting different locations with your little one will encourage their curiosity. By visiting places like local museums, libraries, coffee shops may not seem super exciting to you, but your child will adore these little adventures and depending on where you do, you might learn something too. While we know how much money you have likely spent on toys for your child, playing with household items is surprisingly beneficial to have your kid play with as well. One way to do this is to have your child match lids with the proper cooking pans. Playing the same games over and over again won’t do your child much good. 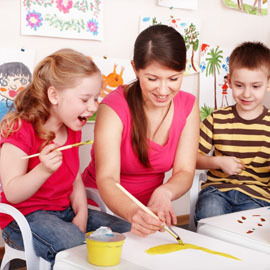 Providing variety to your kid will give them the opportunity to learn new skills. If you are used to playing with building block, perhaps try to engage them in board games or even some sort of sport.